Stand Up Guys is the new septuagenarian crime comedy from director Fisher Stevens and features a trio of beloved elder statesmen from the acting world. While the film is mostly mediocre, there are some bright spots, mainly coming from the interaction between the veteran actors at the film’s core. The film takes place on the day of Val’s (Al Pacino) prison release after a 28-year sentence. He is picked up by his former partner-in-crime, Doc (Christopher Walken), who reluctantly treats his newly sprung friend to a rather eventful night on the town. This includes a trip to a brothel and an inevitable foray to the pharmacy for reasons you can probably surmise. They also rescue their former get away driver Hirsch (Alan Arkin) from his nursing home, which brings the key members of the old “gang” together again to relive those pre-lockdown glory days. What Val does not know is that Doc has been contracted by their former boss, “Claphands” (Mark Margolis), to kill him before the day is out. The lineup for this film is a lot like the list of Best Supporting Actor nominees for the Oscars this year (of which Arkin is one). Much of the joy in this film involves seeing actors we love, do what we love to see them do. 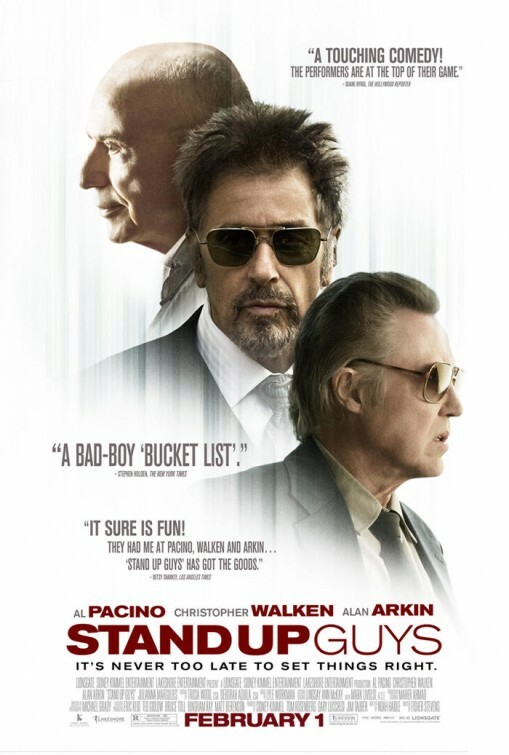 Walken brings his classic delivery to the character of Doc, Pacino’s Val is a dirty yet dignified and loveable old man, and while lack of oxygen probably makes Arkin’s Hirsch slightly more subdued, he is still just as bitingly cheeky as we remember him from Little Miss Sunshine and Argo. Sadly, because there is no playing against type or expectations here (especially with Arkin), our enjoyment of these actors leaves us with a mostly pleasant, if perfunctory film. The parts of this film that do work best are the quiet ones. When Doc talks about how his chosen occupation has hurt his family life, and Hirsch laments about his wife’s death, these great actors easily generate pathos in the audience. A film that recognized this potential power could have been both an insightful look into the nature of reminiscence from the position of former criminals, as well as an unabashed sentimental traipse down geriatric lane. Instead, to help bolster the sometimes dark undertones that accompany characters knocking on death’s door, the film imposes an overwhelming amount of broad comedy on the audience. If the jokes were funny, its presense could be easily forgiven, but erectile dysfunction and hypertension pill jokes just don’t pack the same punch anymore. Stand Up Guys isn’t too far from its potential, but the time spent pandering with humor well past its expiration date makes the film’s best moments a little less satisfying. Stand Up Guys opens today in Philly-area theaters.